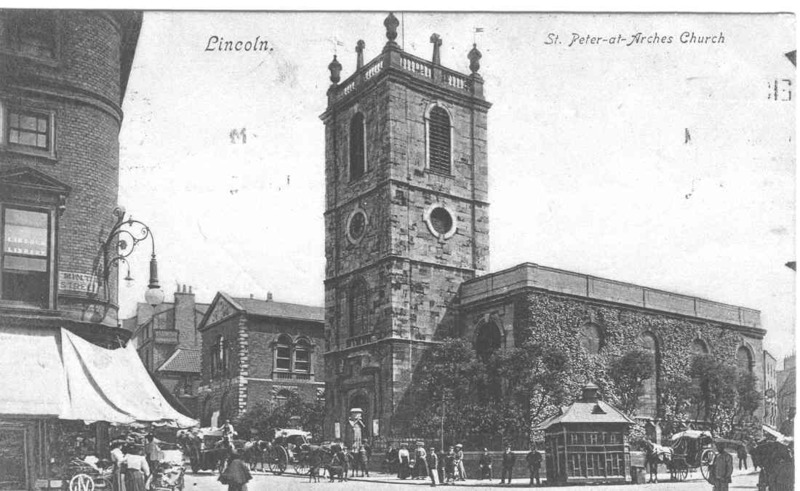 The first known peal rung in Lincolnshire was on 7 December 1738 at St Botolph�s church Boston. This was 23 years after the first ever peal was rung in Norwich. This achievement would almost certainly have been recorded on a board but sadly this has long since disappeared. 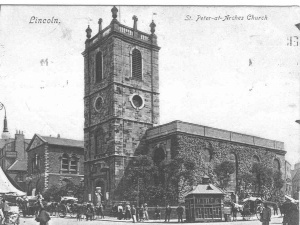 The second peal in the county was rung at St Peter at Arches church Lincoln on 20 June 1756 and was recorded on a board which still exists. 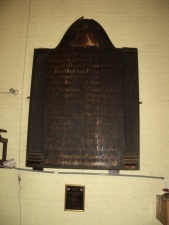 The board, which measures 7ft by 5ft, is attached to a wall in the ringing chamber of the tower of St Giles Church, Lincoln. 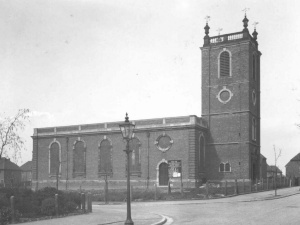 St Peter�s church was consecrated in 1724 and replaced an earlier church about which little is known. This church was close by the building known as the �Stonebow� which was built in the sixteenth century to replace a Roman gateway into the city. The upper storey of the �Stonebow� contains the Council Chamber and, presumably because of its proximity to the headquarters of the City Council or Corporation, St Peter�s became known as the Corporation Church. When St Giles church was built on a new housing estate on the North East of the City it was in the same style as St Peters and much of the stone and lead work was reused in the new building. Many artefacts were also transferred and these included the peal boards hanging in the tower of St Peters. It was also decided to rehang the eight bells in the tower of the new church. It is recorded at the foot of the board that it was restored in 1897 by the North Lincolnshire Association. The varnish applied at that time has crazed and of course materials used for such work have changed since that time. An estimate for the restoration of the board was obtained in 2008 and the cost at that time would have been �2110. After having applied without any success to twelve organisations for a grant towards the restoration of the board I was about to give up hope when I was advised by the Church Buildings Council that present practice in such cases was to conserve rather than restore. This actually makes sense in that an artefact some 250 years old should not be made to look new! I, therefore, obtained an estimate for conservation which amounted to �950-1000. St Giles church couldn�t be expected to contribute to the project and I was in a dilemma as to how to proceed. 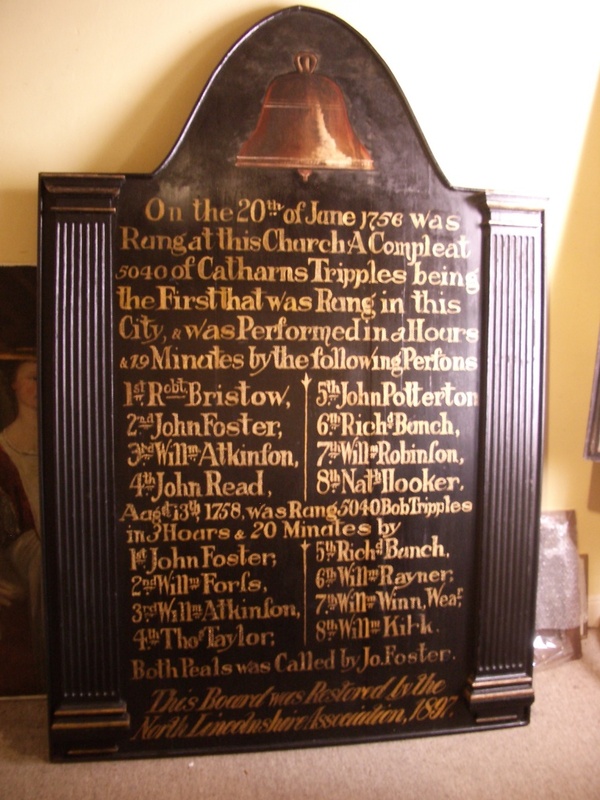 A substantial donation was made by the relatives of David Collis and the proceeds from a talk on bellringing was also gratefully received but it was clear that fund raising could take a long time. By chance I mentioned this matter to a friend who suggested that I approach the Secretary of the Lincoln Branch of the Cory Environmental Trust. This Trust supports the Landfill Communities Fund which is administered by London based ENTRUST. I therefore submitted an application for a grant to the Cory Trust and waited and waited for a response. After ten months I received information that the local trustees of the Cory Trust had agreed that this project had their support and they sent a recommendation to ENTRUST. I wondered if, what must have seemed a small amount, would be agreed by this London based organisation. To my amazement and delight they agreed that we should have the money! Eventually the faculty application was submitted and agreed so the peal board was collected by the conservators in April 2011.
funded by Cory Environment Trust and a donation in memory of David Collis"
Inevitably work on the conservation and repair took a long time and the peal board was eventually returned to St Giles in early December 2011. It was blessed by the Vicar Revd Mary O�Connell on Sunday 11 December before being rehung in the tower. 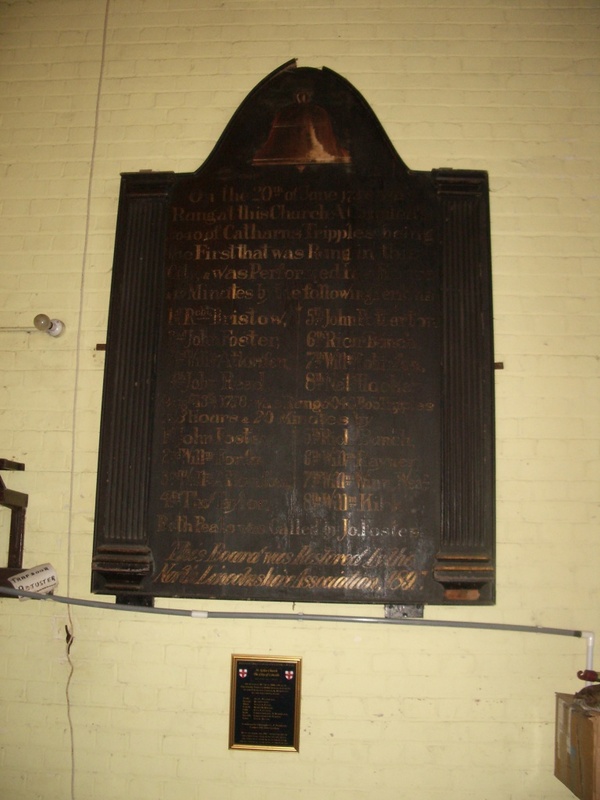 After Tower Captain Michael Stracey had given an account of the two peals which the board recorded and the work which had gone into fund raising to enable the conservation to be carried out the Vicar said she saw the peal board as representing continuity of the Church in Lincoln.